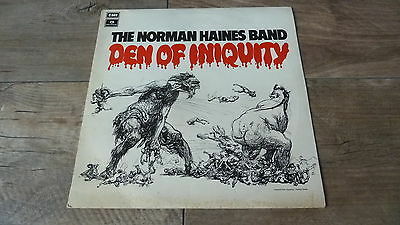 Norman Haines Band - Den Of Iniquity. OriginalUK LP Issued in 1971 byParlophone Records (PCS 7130). Factory Sample Label On Side 2. First Pressing, -1/-1 Matrix Numbers!! Sleeve is inVG+ Condition (has some foxing, see pics). Vinyl isin Excellent Condition (has a couple of hairline surface marks).